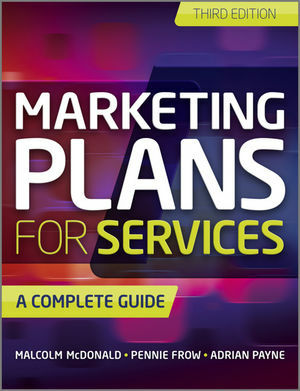 Marketing Plans for Services, Third Edition is written in a pragmatic, action-orientated style and each chapter has examples of marketing planning in practice. The authors highlight key misunderstandings about marketing and the nature of services and relationship marketing. The marketer is taken step-by-step through the key phases of the marketing planning process and alerted to the barriers that can prevent a service organization being successful in introducing marketing planning. Practical frameworks and techniques are suggested for undertaking the marketing planning process and implementing the principles covered. The world renowned authors also tackle key organizational aspects relating to marketing planning which can have a profound impact on its ultimate effectiveness. These include: marketing intelligence systems; market research; organization development stages; marketing orientation. Marketing Plans for Services is for marketers in the service sector and students of marketing. Malcolm McDonald, MA(Oxon), MSc, PhD, D.Litt. FCIM FRSA, author of 43 books, until recently was Professor of Marketing and Deputy Director of Cranfield School of Management. Malcolm is a graduate in English Language and Literature from Oxford University, in Business Studies from Bradford University Management Centre, and has a PhD from Cranfield University. He also has an Honorary Doctorate from Bradford University. Malcolm has extensive industrial experience, including a number of years as Marketing Director of Canada Dry. He is Emeritus Professor of Marketing at Cranfield and is a Visiting Professor at Henley, Warwick, Aston and Bradford Business Schools. Pennie Frow, PhD MBA BSc (Hons) Psych DipM FCIM, is Associate Professor of Marketing in the Discipline of Marketing at the University of Sydney. Previously she was a Senior Consultant in the Cranfield Marketing Planning Centre and a Visiting Fellow at Cranfield School of Management. Before joining Academia, she was Chief Marketing Officer of a major British charity and Managing Director of a US distribution company. Her publications have appeared in many academic publications including the Journal of Marketing, Journal of the Academy of Marketing Science, Journal of Business Research, Industrial Marketing Management and the Journal of Marketing Management. Adrian Payne, PhD MSc MEd FRMIT FCIM FHEA, is Professor of Marketing at the Australian School of Business at the University of New South Wales, Australia and Visiting Professor at Cranfield School of Management. Previously he was Professor of Services & Relationship Marketing and Director of the Centre for CRM at Cranfield. His industry experience includes positions as Chief Executive for a manufacturing company and senior appointments in strategic planning and marketing. His many books and articles include contributions in the Journal of Marketing, Journal of the Academy of Marketing Science and the Journal of Business Research.